Not all the fun in Jackson is strictly outside of the confines of building walls. As the off-season creeps in and camping becomes less pleasant due to colder weather, heading to the theater in Jackson Hole for an evening of entertainment indoors is a great alternative. There are a few options depending on when you are able to attend a play, what kind of show you are wanting and whether or not you would like dinner to go along with your entertainment. 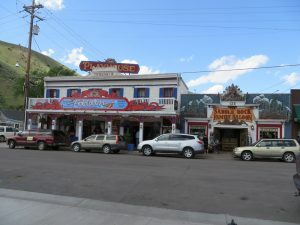 Located at the oldest building in the town of Jackson, The Jackson Hole Playhouse provides the classic western feel that many come seeking when visiting Jackson. With shows paired with dinner (optional) Monday through Saturday nights during their on-season June 1st- October 6th 2018, there is plenty of opportunities to see a play. Currently this year the featured play is “The Ballad of Cat Ballou” which is aptly described by the theater company as “A Zany Western Musical Comedy”. See their site for further details and reservations. Off Square offers unique performances as the Resident Theater Company of the Jackson Hole Center for the Arts, they perform at both the full 530-seat Center Theater and the intimate Black Box theater which has 100 seats. Recently, Off-Square also held a performance of Macbeth outdoors at the center for the arts in their brand new series “Thin Air Shakespeare”. Off Square Theater Co. does not have performances quite as regularly as the playhouse, with performance dates on select weekends throughout the year making each performance a bit more special. Their next upcoming show “Annapurna” is set to take place on November 1st-3rd and 8th-10th, at 7:00 pm. Check on their site for tickets and more upcoming performances as they are announced. If watching a play is not exactly what you had in mind, there are several other options for live entertainment in town including various live concerts, speakers and more. 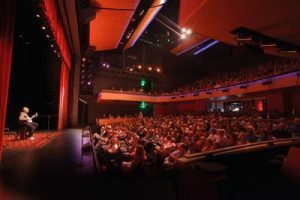 The Center for The Arts and the Pink Garter Theater host and book all kinds of different artists and shows, check out their calendars for upcoming events. For more consistent live music the Million Dollar Cowboy Bar has live bands nearly every night, and the Silver Dollar Bar at the Wort also offers live music weekly.